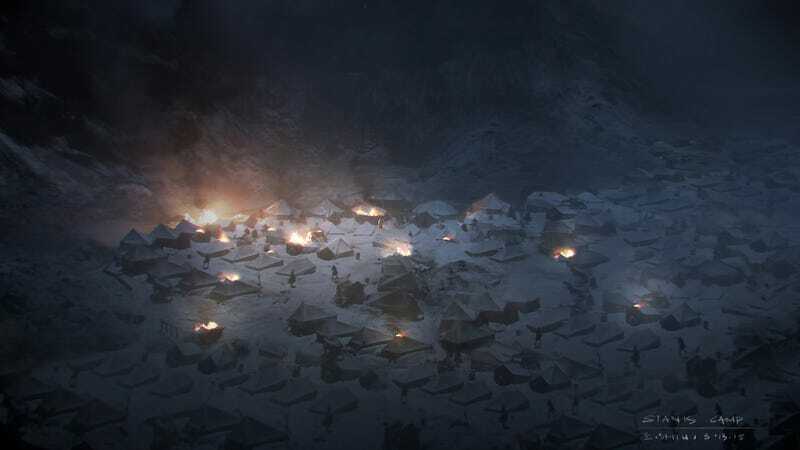 Last night’s Game of Thrones had some pretty insane set pieces, and a whole lot of tragedy. But one image in particular stands out in its fierce beauty — and it’s another thing entirely to witness it in its full painterly splendor. Check out concept art of the season finale from awesome artist Emmanuel Shiu. Yep, it’s a sad day for fans of Stannis “The Mannis” Baratheon, the One True King of Westeros. He got pretty conclusively pwned by the Boltons, and apparently died. And that one visual, of the calvary encircling and just crushing Stannis’ foot soldiers, is going to stick in our minds for ages. That poor tiny army of bedraggled soldiers — you can just see them shivering and huddling as the horses bear down on them. It’s kind of insane. See more of Shiu’s artwork at his website.